It’s 11.30 am on Saturday. “Half an hour to go,” says Mark. “Are we going to be ready?” We all look towards the door. Sunlight beams into the kitchen but is that just a hint of panic in the air? Certainly not. That aroma you can smell is tandoori chicken in the oven with cumin roast potatoes. 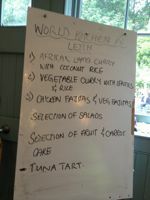 The World Kitchen in Leith is preparing for the first big meal of the Big Tent Festival weekend and there is a whole lot of cooking going on in the smartly converted old stable block of the Falkland Estate. There’s chick pea curry on the stove, plates of pasta and bowls of salads laid out on the table, boxes of rolls piled up at the side waiting to be filled with shredded pork for the meat eaters. And that’s just for lunch. The fridge is full of burgers – veggie and pork – for tonight’s barbecue. Hidden beneath the table there are boxes of fruit, vegetables, rice, lentils and spices of all kinds. Enough to start a street market. At 12 noon the first diners arrive and after that there are few opportunities to check the time. 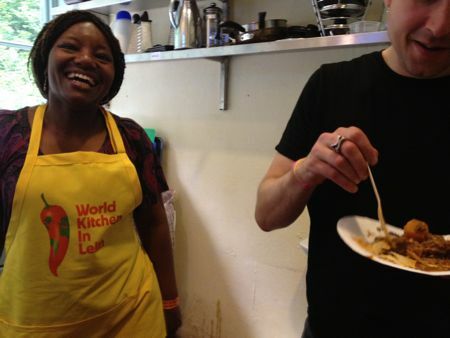 World Kitchen has been booked to feed a total of 600 over the festival weekend. 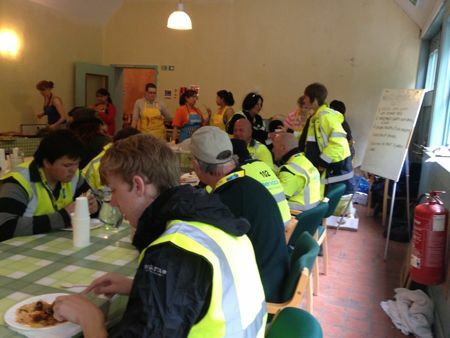 Two lunches, two barbecue suppers – sustenance for the amazing crew of volunteers who help to make sure the Big Tent festival is a safe, clean and welcoming experience. That’s everyone: car park attendants, rubbish recyclers, security staff, police officers, office folk and meeters and greeters of all kinds. 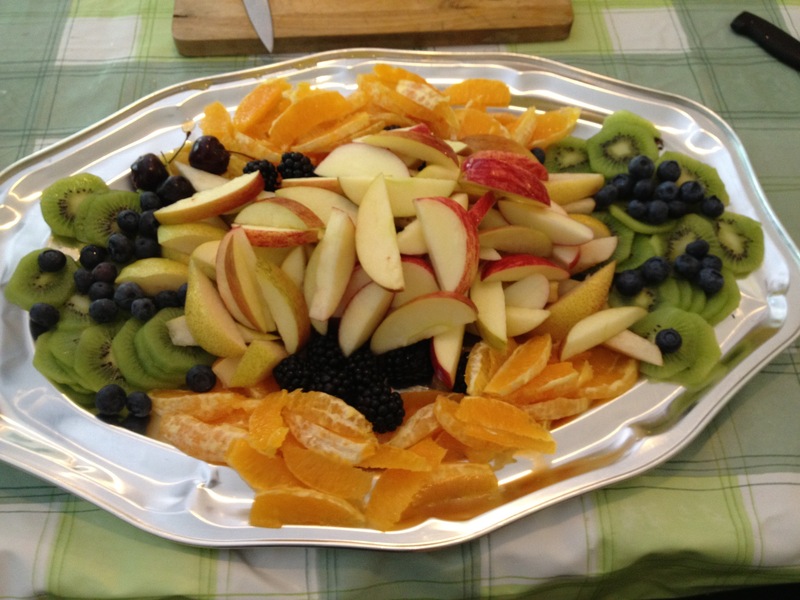 We’re feeding some of the stars too but for the most part they eat in the quieter wood lined quarters of the old stable stalls. Infectious music echoes round the park reminding us there is a festival going on out there. There are a few scary moments. Health and Safety do not go mad but the man in a white coat keeps a watchful eye over us on the first day – next day he appears in a black T shirt which seems a good sign (it is.) Overall, the weekend is an wonderful, exhiliarating teamwork experience. 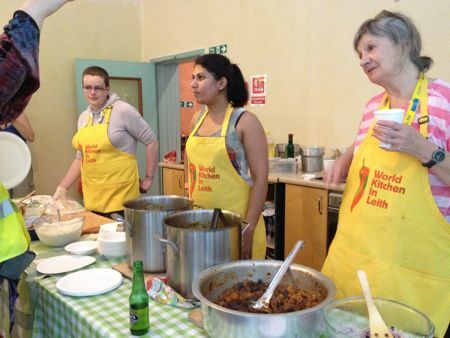 Not least because of the enthusiastic, tireless volunteers, Edith, Margaret and Karen who join the World Kitchen team to prepare and serve the meals – and help to clear and wash up afterwards. Next Next post: Left foot forward?